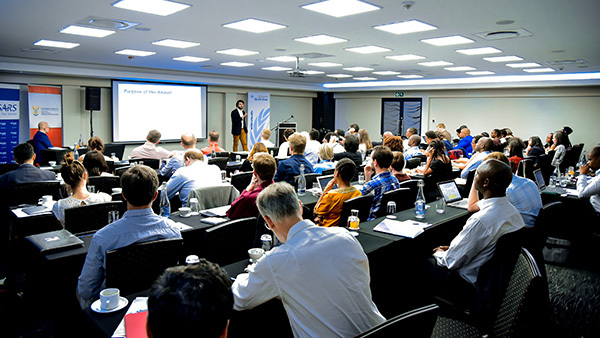 I found myself in the third-floor conference rooms of a Pretoria hotel for a meeting with economists, researchers, and policymakers involved in the SA-TIED programme. We had gathered here to discuss research progress in SA-TIED for two of the six work streams: Public revenue mobilization and Turning the tide on inequality. These work streams have been some of the first to work with new datasets in South Africa derived from the tax authority. By making this data available for research purposes, SARS and the National Treasury have been laying the groundwork for a deeper understanding of the South African economy. Murray Leibbrandt opens a stakeholder engagement event at the Protea Hotel in Pretoria, South Africa. The datasets contain hundreds of millions of data points and include all the information collected by SARS from 2008 to 2015 from taxpayers. They are fully anonymized and secured, containing information on incomes, employment, profits, losses, and taxes paid by individuals and firms. One panel that matches employees and employers has over seven million data points. Another dataset tracking individual income from 2011 to 2016 has about one hundred and forty million observations. For researchers, the datasets represent an opportunity to verify theories and make policy recommendations rooted firmly in comprehensive evidence. There was much to discuss, especially about what could be learned from the data. Topics covered important national issues, like how best to generate revenues for programs that would spur economic development and reduce longstanding inequalities, and what kind of analyses might broaden core disciplines like economics and public finance. Charl Van Schoor tells researchers about the datasets from SARS administrative data. A day prior, I had been given a tour of the data lab. After passing through security at the National Treasury and being met by a Treasury official, I was escorted to the 20th floor where I was greeted by South Africa’s economic policy research team. My colleague, Amina Ebrahim, met me there. She is a research associate with UNU-WIDER and has been working in the National Treasury over this past year, helping to establish the latest tax datasets for researcher access. Amina’s fingerprint opens the door for me to the secure terminals. The newly constructed secure data facility high above central Pretoria hums from the cooling fans on the server. 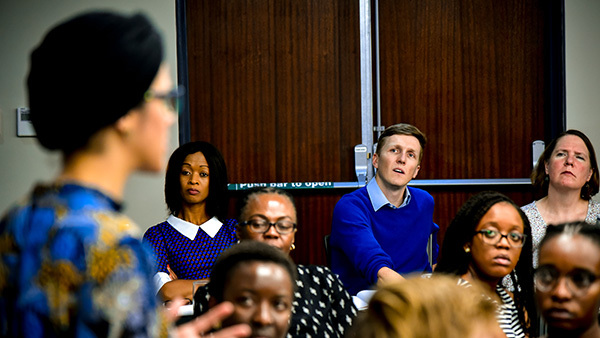 It is hoped that here, in this room, researchers will begin to compile some of the data that policymakers will eventually use to make evidence-based decisions for South Africa. The lab is not impressive to look at, consisting as it does of thirteen simple desktop computers on plain tables. Sometimes the things which can make the biggest impact are unassuming. I’m not a data scientist, so instead of booting a computer and looking through the raw data, I sought out my translators: the researchers. I asked them, what can the data tell us? They aren’t quite sure . . . yet. Which isn’t as satisfying an answer as I had hoped to hear. Amina Ebrahim speaks to a full room. There is certainly enough data, but learning what the variables actually capture, and being careful not to misunderstand what meaning can be derived from them requires careful analyses and good judgement. There are also some issues with the collection and coding of the data. In the past, SARS has collected the data as a part of collecting taxes. This means that data hasn’t been collected with the specific goal of building datasets researchers can use to answer specific questions. Researchers need to try and arrive at the data terminals with an open mind. Instead of asking how the data can answer their questions, they need to re-wire themselves to ask what questions can be answered with these particular datasets. 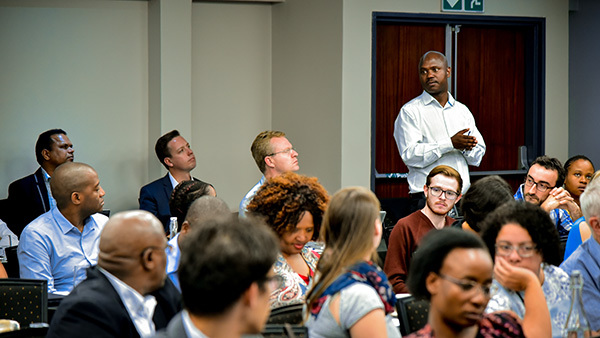 The introduction of the data programme has sparked an ongoing dialogue between researchers and tax officials. That dialogue is helping researchers understand which questions the data can answer today, but it is also a part of re-tooling data collection for the future, to make it possible to answer new questions as they become more pressing. Research on South Africa’s economy tells a story of high inequality that persists over time. The oft-heard assertion about the South African economy is that it is the most unequal in the world. Worse still, recent research seems to indicate that inequality has become worse. There’s good news in the research, too. For example, recent analyses suggest that South Africa’s tax and transfer system progressively redistributes more income than any other middle-income country in the world. This is chipping away at old inequalities. But is it enough? Will the tax data corroborate the story of a tax and transfer system that is largely working? And, will researchers be able to find other ways to broaden inclusion in the South African economy in the future? Kezia Lilenstein tells about new opportunities for gender equality research in the datasets. The transfer system keeps millions out of extreme poverty, but not being the worst-off is hardly something to aspire to. What will lift South Africans above that? Income and employment are what really matter for families in South Africa. With access to the data, researchers will soon be able to tell us about who gets hired for which jobs, and how much they get paid. They may be able to make inferences about when and why companies hire more people and which tax policies influence this. 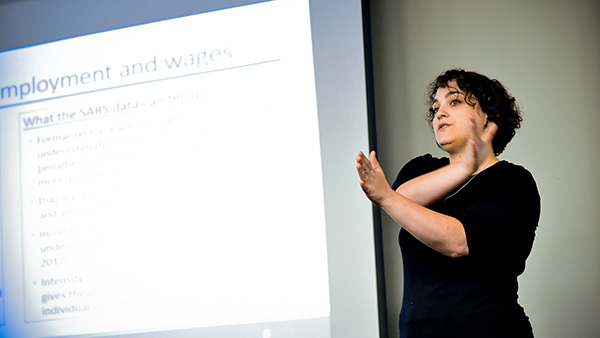 Access to the data is helping to build the kind of expertise that helps policy makers to understand and correct for injustices like the gender pay gap and to decide which firms should be given employment subsidies in order to maximize employment increases. Zama Vara from SARS directs a query to the audience. 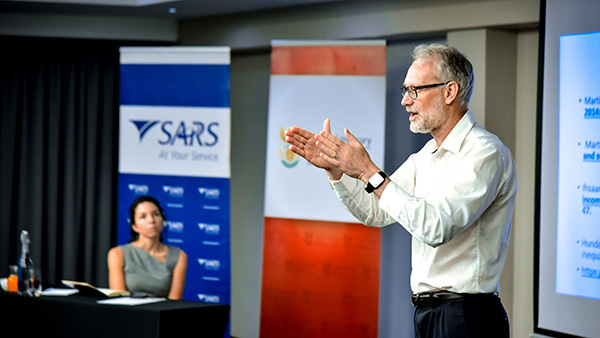 Research using administrative data can also supplement findings from the tax microsimulation models that the Southern African Policy Research Institute, or SASPRI, updates and provides to SARS and the National Treasury. These simulations offer a way for policy makers to see the impact of new policy measures on the economy. Together these research tools can help answer questions such as: is it a better for low-income households to use VAT zero-rating on common purchases or to collect the revenue and use it for direct transfers? The researchers and policy makers involved in SA-TIED are trying to answer these kinds of questions. In the process, they are building and maintaining the datasets needed to solve future problems. An open request for research proposals wrapped up at the end of November and, through that process, new members will join the SA-TIED team with fresh ideas for next year’s research. Keep your eyes on our opportunities page for your own chance to get involved.